Lloyd Loom chair is back! Our Lloyd Loom chair is back, repaired and resprayed, and ready for use in A’s bedroom Lloyd Loom have been making woven furniture for nearly a hundred years. The weave is made from twisted paper and wire and the frames are traditionally made from steam-bent beech wood to create the iconic furniture. The original factory was destroyed in the Second World War, but in 1985 David Breese, a Lincolnshire furniture maker, started manufacturing in Spalding after researching the original techniques of steam bending, weaving and braiding to reproduce the original designs. Today the wide range includes contemporary and classic designs for indoors and outdoors. We bought the “Lusty” chair, along with a couple of laundry baskets on ebay, but the seat needed a small repair. 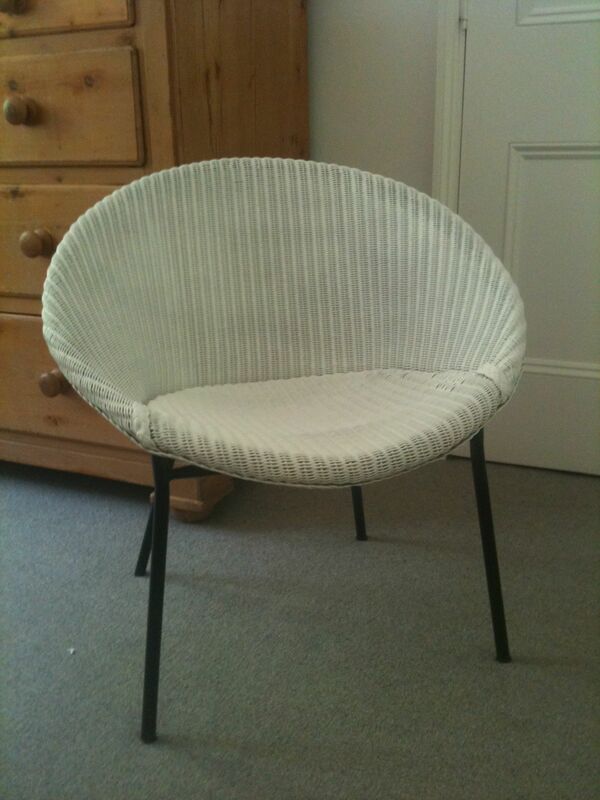 Lloyd Loom recommend Paul Boulton of Cane Chairs Repaired, a member of the Guild of Master Craftsmen. Paul fixed the weave in the seat of the chair and gave it a fresh coat of paint. Now this timeless design is rejuvenated for another generation to clamber over and read stories in! P.S. The Elves and the Chairmakers is the story of 5 designers spending two days at the Lloyd Loom factory for an intense experiment condensing the process from design concept to prototype. The weekend produced 13 pieces for the staff to find in the showroom on Monday morning, 7 of which went forward to further development.